Minister of State for Antiquities Affairs Zahi Hawass has been sentenced to one year in jail on Sunday for refusing to fulfill a court ruling over a land dispute. The Egyptian criminal court also said Hawass must be relieved of his governmental duties and ordered him to pay a LE1000 penalty. Hawass failed to adhere to a ruling in favour of his opponent over a land dispute when he was in charge of the Supreme Council of Antiquities (SCA). The SCA appealed the court ruling, arguing that the land includes monuments and therefore should be treated as government-owned land. Hawass was recently re-appointed as antiquities chief in the newly-formed cabinet of Prime Minister Essam Sharaf. People in high places always make enemies. Yes Dr Hawass does appear as arrogant, self opinionated and domineering, and definitely a law unto himself. Yes he was part of the old regime that ruled Egypt, maybe guilty by association but he has archaeology and Egypt's past running through his veins. There must be many brilliant archaeoligsts in Egypt, who have stood in his shadow, but I truly believe he's tried to bring back Egypt's previously plundered past to where it rightfully belongs, and I think everything that has been removed should be returned. Give him credit for the good he's done please. This adds to the joy of my day . Tho, I think he needs to be there a lot longer ! 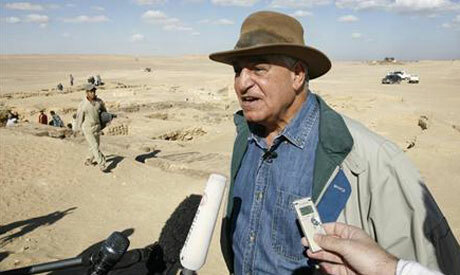 Zahi Hawass "A Great Scholar & Archaeologist"
I Have the highest respect for Mr. Hawass. He has expanded greatly the knowledge we have of ancient Egypt and the nations which associated in some way with Egypt. He is truly a great man. For years I have been hoping for this. Not glad that anyone is sentenced to jail, as much as I personally do not like him, but I have always felt he is tenaciously protecting/hiding truths that he does not want the world to find out. I have no proof, but I strongly suspect we may find ancient Egyptians are not necessarily related to todays Egyptians or perhaps as the Bible states, that Egyptians were the ancient Jews since G-d calls Egypt 'My people'. There's a lot to discover and I hope this change paves the way and more truth is revealed and quickly to the entire world. I love Egypt and her people, but I do not believe ancient relatives of those who live today built the pyramids and Hawass among most others have insisted and provided ridiculous, quickly accepted theories which don't ring true. Of course they want to keep their cultures claim the fame, but all should be more concerned with truth than with preserving their position in history. Mr. Hawass has done a lot for the antiquities found in Egypt, but at the same time, he is very much against letting ANYONE else postulate a theory on any new discovery. How come every time there is a new discovery in Egypt I see Mr. Hawass in the middle of it, and it is always HIS theory that is accepted. This is not responsible accademia. Come on people - he is just a flawed human being like the rest of us; however, Mr. Hawass has single-handedly done more for the preservation of Egyptian antiquities and monuments than anyone else in his country. Give the guy a break! YAY! Now if only the History Channel would stop showing his shows and start showing GRAHAM HANCOCK & ROBERT BAUVAL. Will they now be able to investigate under the Sphinx?